Yesterday afternoon, my husband and I drove the winding mountain roads that lead through tall pine trees to the old inn, where we’ve come for a weekend escape. Even though it’s June, the mountain air is still cool so the sunlight felt good as we walked familiar piers and beaches, finding wooden benches where we could sit and talk. The summer season doesn’t really begin here until July: the little towns were empty and everywhere, summer cottages were still boarded up. We had the place to ourselves — well, except for the black flies. We had to be strategic about where we walked, looking for any place with a breeze to keep away the clouds of annoying black insects. 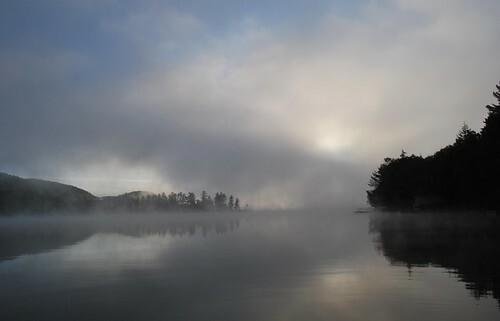 I woke up this morning to blue light reflected from the mist of a mountain lake. Without even checking the clock, I climbed out of bed, pulled on some clothes, and grabbed my camera for an early morning walk. No one else was awake, not even the black flies, it seems, and I had the whole lake to myself. I walked along the shore, testing out floating docks that creaked and swayed under my feet. I wandered about happily, exploring and taking pictures, the dew soaking my socks and sneakers, until I was chilled through. I came back quietly through the side door of the inn, taking off my wet things to climb back into bed with a warm husband, who was still asleep. Ah, what a beautiful scene. Hope you are enjoying your get-away! Our summer "season" begins sometimes in April, by May for sure. Can't imagine living where summer comes so much later. Again, your photos are wonderful. L: Yes, I've come to this same inn many times — and I almost always wake up early to take a walk by the lake. Usually, I come here with my husband in the summer, and every fall, I bring my parents here. I'm VERY predictable! Early morning is a magical time of day and these photos prove it. What IS it about those black flies at this time of year. We've had them up north, too. But then when you have a view like the one you show, the peace, the tranquility, the glorious beauty of it all, yes -- you can even survive the flies. 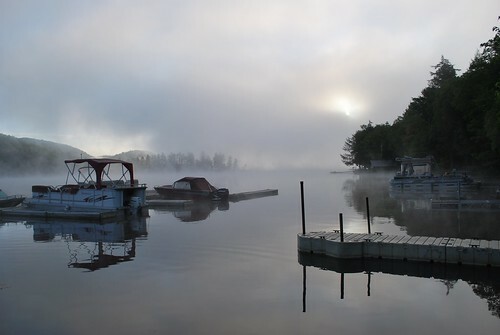 My family used to vacation in the Adirondacks (Fish Creek, near Tupper Lake). I liked it well enough then (I was between 5 and 10 years old), but I bet I'd love it now, as a kayaker and the http://www.northernforestcanoetrail.org/ available. What a wonderful smell you've conjured in my nose. That's right! You go with your parent in the Fall, I remember those posts now (it's more regular than the getaway with your husband ;-) You two generally go to the West Coast o vacation, right? Maybe that's coming up?). L: Yep, that's right. I go to the mountains every fall with my parents -- and we always stay in the same place. My husband and I vary our vacations a bit more, and we go to the west coast at the end of July if we can afford to. Yes, black flies do bite. They especially like to get underneath long hair. When I was a kid, I used to end up with a lot of bites on the back of my neck. What a serene scene to find in the early morning. Lovely light and calm there. Beautiful! Reminds me of our vacations as a kid in New Hampshire. this is, without doubt, the most beautiful, peaceful place i have seen in a long time. can you fit me into your suitcase??? ?